Are you stuck baking for your kids' class Halloween party? It can be a stressful prospect these days, what with Pinterest causing serious one-upmanship among parents. Sure, all those ideas are obnoxious nice, but who has time to bake cupcakes that are wrapped in fondant to look like mummies? Or decorate sugar cookies like witches' fingers? Or turn chocolate-covered strawberries into licorice-accented mice? I'm exhausted just thinking about it. 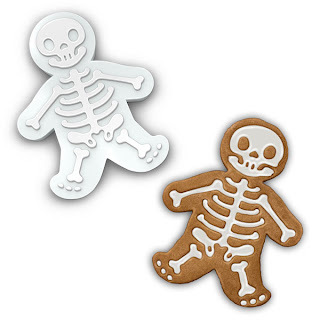 Especially when ThinkGeek has these geekdorkable cookie cutters to make GingerDEAD men! I can't decide if the best part is how easy they would be to use (press and cut, bake, fill with icing) or how awesome the final product looks. Little dead gingerbread men, in yer mouf. NOM NOM NOM.